These exchanges became a perfect connection to our Who We Are unit of inquiry as we explore the idea that by sharing experiences within our community we can learn about ourselves and others. The teachers agreed that the children could taste the apples and decide for themselves. We feel that children should know that an exchange of viewpoints is highly valued in our context. We asked who wanted to be a taste-tester, and proposed that the children calculate how many slices would be needed. MA counted “1-2-3-4-5″ taste-testers volunteered. There was some negotiation while the teacher began to cut an apple, first in half. Jack noticed that, “We need(ed) to make them (the slices) littler,” anticipating that by cutting the apple only in half, we would not have enough slices for one for each of the taste-testers. The group agreed that five slices per apple would be enough and we cut as the children had suggested. The children shared their different reactions to the tasting. We noticed that some of the children’s words of praise for the sour apple taste differed from their facial expressions. Rebecca proposed that we might use the apples for some cooking and the children enthusiastically agreed. We wondered where we might find a recipe and we organised a trip to the library to find some cookbooks. Andrea, Lance, Finlay, Eleonore and Clara met with Ms. Jayne who gave us a tour of the library and specifically where we could find what we needed. We noticed that there were different types of pies we might bake and took a selection of books with different recipes. The children promised Ms. Jayne that we would return with a slice of pie to share with her. We shared the recipes during meeting time. Sanela helped us to make a list in German of the needed ingredients, using German for a meaningful purpose. The children graphically represented the ingredients needed for the recipe. We also read a book called Apple by Nikki McClure​, following the life of an apple and exploring the cyclical patterns in nature. 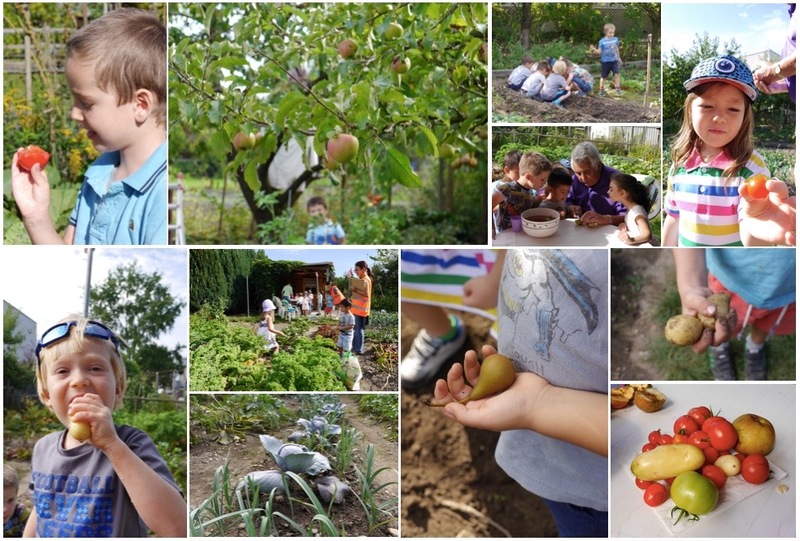 We will explore these ideas further in the context of local harvest in our own community, with a visit to an apple tree in Maxi’s Opa’s garden. Eleonore, Clara, Lance, Owen, Albert, Smilla and Mathilda met in the kitchen to prepare for baking the pie. First we used the apple peelers to prepare the apples with much discussion about safety. The children were careful to hold the peelers in the correct direction. We washed the apples and measured the ingredients. Some children helped with poking holes in the pie crust. We read to find out how long we had to wait for the pie to cook. Elena helped by setting a timer and joyfully informed us when the bell sounded. The entire EYC enjoyed the smell of the pie baking. Maxi’s Opa maintains a beautiful plot in the local community garden. We were fortunate to be invited for a visit. We tasted tomatoes, dug for potatoes and cut lettuce and kale. The children were highly engaged with the environment, each other as well as Maxi’s grandparents. These encounters represented the meaningful ways that children can drive their own learning. 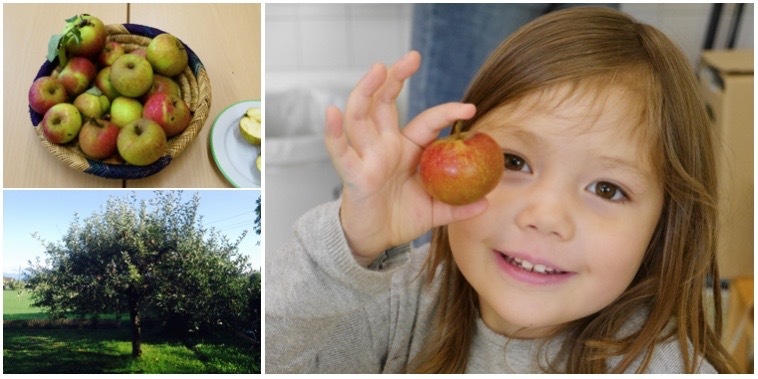 As we shared experiences around the apples, there were abundant opportunities for rich learning connected to our unit. Children needed to integrate mathematical thinking for a purpose as they predicted, calculated and compared during the tasting and cooking. Literacy was valued in a real life context as the children were motivated to write for a purpose. Communication skills like listening and speaking were required and valued for participation. These experiences were a beautiful platform to develop the children’s sense of themselves in our group, their place and the reasons why particular places are important to people. Early Years Teacher International Schools. Reggio Inspired and IB PYP.  Apple Distinguished Educator 2010. Level 3 Forest School Leader 2016. Learner. Traveler. Reader. Australian. Tea lover. I especially loved the integration of German description and explicitly pointing out how the various aspects of communication, including literacy, were needed for the activity in a highly motivating setting. I am so happy to see you all interested Opa’s garden. Maybe you will want to start your own garden. My students just planted lettuce and sweet basil, and we plan to plant so much more. I just wish I had so many beautiful tomatoes in my garden. They are my favorite! I really liked the idea. Learning through real and hands on experience has no match, and this learning would stay with them for the lifetime. Please do share some ideas for grade 5.